This is the story of what happens to Marjane Satrapie after she goes to Austria at the end of Persepolis 1: The Story of a Childhood. This book focuses on Marjane's rebellious teenage years in Austria and her early 20s after she returns to Iran. This book was much harder for me to read than the first volume of this series. Unlike The Story of a Childhood, Marjane does not mention very many memories containing love and hope. Due to being away from her social support network, Marjane's years in Austria are very challenging. In addition, once she returned home to Iran, Marjane has difficulty reconnecting due to culture shock and embarrassment about how she lived her life in Austria. I am not sure how I feel about this book. I did not really enjoy it; however, the metamorphosis that Marjane goes through in the book is not surprising and makes sense given who she is and what makes her tick. If life had been a fairy tale for Marjane, I would have been upset that the book was not more realistic. I guess in the end, I want characters that I have grown to care for stay sheltered. I will admit that I am curious about Marjane's life post-The Story of a Return, and I want to read more about the author now. 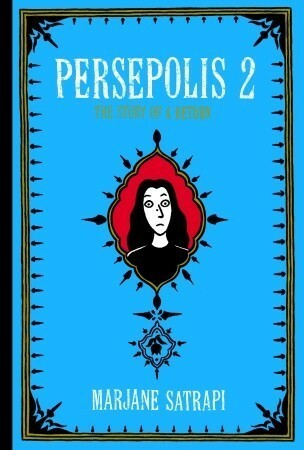 Sign into Goodreads to see if any of your friends have read Persepolis 2.